Building a PC into this case wasn't difficult at all, but it revealed some interesting things. Firstly, that raised flange on the top right edge of the motherboard tray is a little odd. I guess it's there to help you lift the tray out of the case, but on a full-size ATX motherboard it's not very far from the edge. It's high enough that the sideways-facing IDE ports on ABIT's AN7, to choose one example, won't be blocked by it, but you might want to confirm that your motherboard doesn't have anything which will be fouled by this bit of aluminium. It made installing IDE cables onto the DFI LanParty NFII Ultra B a little fiddly, but no major complaints. 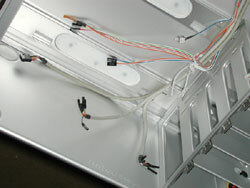 The locking plate and thumbscrew for the motherboard tray can be moved to a lower position if you find it blocks anything. Quite a bundle of cables runs down the inside of the case. These connect from the motherboard to the front panel on the top corner of the case. 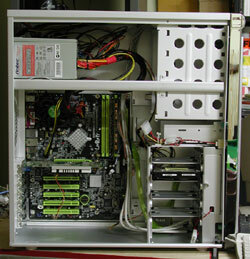 Audio, USB, Firewire etc are carried as per usual, along with the reset switch, ATX power switch, HDD LED and so forth. Interestingly, there's also two thermal diodes, the flat kind, which you could stick to the back of your video card and perhaps your CPU heatsink, or whatever you felt like monitoring the temperature of. 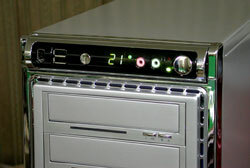 These temperatures are displayed on the front of the case, on the rotating panel. There's a small click-switch on a remote wire for changing between Celcius and Fahrenheit. One thing that had me confused at first came after I'd installed the motherboard on the tray. Antec include a decent collection of screws and standoffs with the case, so I duly used the small brass standoffs and some standard screws to secure the motherboard. After doing so I noticed these other screws, which look as though they would screw into the motherboard tray and have a standoff section with a flange on the head. I puzzled over how these could be used to mount the motherboard, because without some plastic spacers to support the motherboard above the tray, the board could easily fall back onto the tray and short out. It was only when installing a hard drive into the case that I realised they're for the HDD mounting trays. These trays have rubber washers to isolate the vibration of the hard drive from the chassis. These long screws are used to screw into the four holes on the bottom of the hard drive, through the rubber washers, and secure the drive to the tray. If you're concerned about hot-running hard drives that are required to be screwed securely to the chassis for heat-dissipation reasons, remember that this case has a 120mm fan mounted to cool the hard drives in their bays. Even the hottest drives should be fine in that location, provided the fan is spinning. These rubber standoffs for the hard drives a really nice touch by Antec and indicate the thought that has gone into this case. Another example is the use of a large adhesive cable tie at the top of the case, to keep the bundle of cables coming from the rotating front panel clear of the 5.25" drive bays. Nobody would complain if this wasn't there, but the fact that Antec included it shows that they're really thinking about the real-world use of this product. Finally, everything is installed. You can install the hard drives with cables facing in or out - I faced mine in for tidiness. 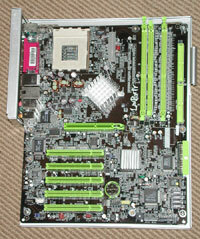 You may have noticed that the removable motherboard tray does not include the PCI backplate frame. I wondered if trying to install a motherboard onto the tray, with AGP card and some PCI cards installed, would make it difficult to install the tray into the case - it doesn't. You insert the tray then slide it gently to the left, which gives you time to make sure the cards are lining up with the case properly. One quick note on the 120mm rear fan. After the picture above was taken I installed it. The mounting screws aren't screws at all, or plastic lugs, but odd bendy rubber bits that you pull through the mounting holes then cut off. They're very much single use, but they do isolate the fan from the frame, once again, for the sake of silence. The red glow is some status LEDs on the DFI motherboard, which combine in the picture with the very bright 120mm LED fan and give the purply effect. In fact, the three blue LEDs in the front intakes are a more aqua colour than the electric blue of the LED fan. Overall the effect is pretty good and the case looks quite impressive. Once I unplugged the CPU fan, the system is virtually silent. 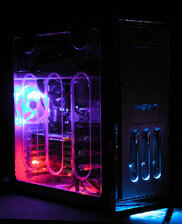 The two big case fans and Antec's PSU contribute to a very quiet experience. It flicks automatically between the two sensors every couple of seconds or so - the green LED next to the display shows which sensor is currently active. On that display there's also the power LED (green) and hard drive LED (red, unlit in photo). You can also see the 5.25" drive bay covers, two of which are provided to prevent your boring beige drives from spoiling the looks of this case. Antec have impressed me once again. The styling of this case is a standout although I'm sure there'll be a lot of debate about whether or not people like it. From a practical point of view it's very hard to fault. An extremely well-built and lightweight case which runs quietly with good cooling, is easy to work inside and brims with genuinely useful features. At the time of writing, the street price seems to be a smidge over AUD $200 for this case with a solid side panel, which is a pretty good deal. With the side window panel it's closer to $240. Recommended! 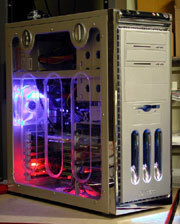 Antec products are distributed in Australia by Altech Computers.